Five miles of (mostly) downhill to go. Running through an old growth forest of Jeffrey Pine, Sugar Pine and Incense Cedar, I relished being on a pine needle covered trail at 7000 ft. in the San Gabriel Mountains. In a record dry water year, I had been curious to see how the mountains were faring. Although creeks were very low and grasses dry, my impression was that groundwater resources were not quite as bad. The usual springs and seeps still muddied the trail. 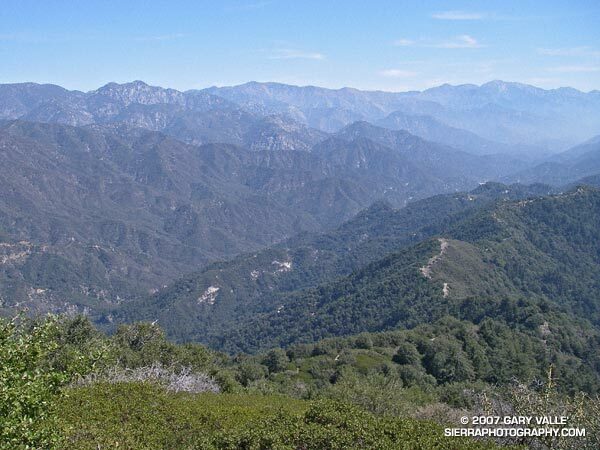 In 2005 the San Gabriel Mountains were deluged with rain, and in the 2006 the rainfall was nearly normal, so some carryover would be expected. Update May 27, 2007. My impression of groundwater resources may have been overly optimistic. On a run to Mt. Baden-Powell from Islip Saddle, I stopped by Little Jimmy Spring. It was nearly as low as in late August 2002, when Los Angeles had just experienced its driest water year on record. This year will likely break the 2001-2002 record. Even so, it was obviously much drier than normal. There were fewer wildflowers, and some young Incense Cedars looked as if they might be stressed. On the plus side, manzanita and currant were blooming in profusion, and perhaps 30-35 scarlet red stalks of snow plant were seen on the loop. About three miles from Three Points I happened upon another Jeffrey Pine that had been struck by lightning. This strike appeared to more energetic than the bolt that struck the tree on the Baldy North Backbone Trail. The spiral scar was wider and braided at some points, and the strike ignited the tree. Where the Baldy tree was on a sharp ridge crest, this tree was several hundred feet below the main crest in an area where the trail started to work around a projecting ridge. More about this loop and a Google Earth image of the course can be found in the post Manzanita Morning. Of all the faces of Los Angeles perhaps the least well known is the Angeles High Country. Entirely within the County of Los Angeles, the lofty peaks and chiseled canyons extend from Mt. Waterman on the west to 10,064′ Mt. Baldy on the east. It is rugged and wild — the home of ancient trees, big horn sheep, black bears and mountain lions. This view of the crest is from the Rim Trail, on the steep eastern shoulder of Mt. Wilson. From left to right the prominent peaks are Mt. Waterman (8,038′), Twin Peaks (7761′), Mt. Baden-Powell (9,399′), and Mt. Baldy (10,064′). The lack of snow is indicative of the meager amount of precipitation we’ve had this Winter. We were running the Rim Trail as part of an approximately 22 mile loop from Shortcut Saddle on Angeles Crest Highway to Mt. Wilson and back. The loop incorporates several segments of the new 50 mile course that is part of the Mt. Disappointment 50K/50M Endurance Run. 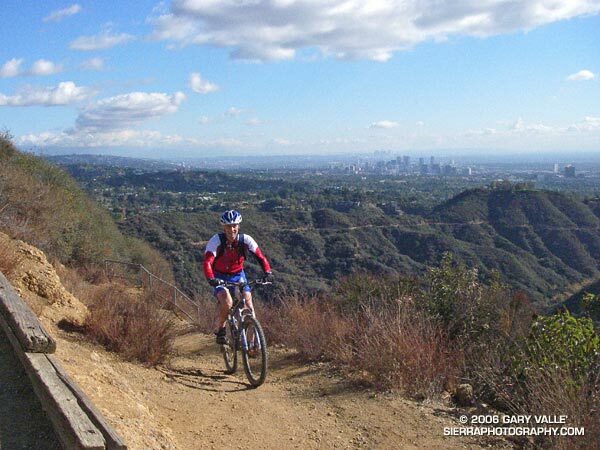 The segments of the loop that are on the 50 mile course are the Silver Moccasin Trail, Gabrielino Trail, Kenyon DeVore Trail, and the Rincon-Edison Road. Here’s a Google Earth image and Google Earth KMZ file of a GPS trace of the route. Much of the winding 5.6 mile climb out from the W.F. San Gabriel River on the Rincon-Edison Road is steep and shadeless. Rincon-Edison Road is also used (under permit) by off-road vehicles — we encountered two dirt bikes and a jeep. 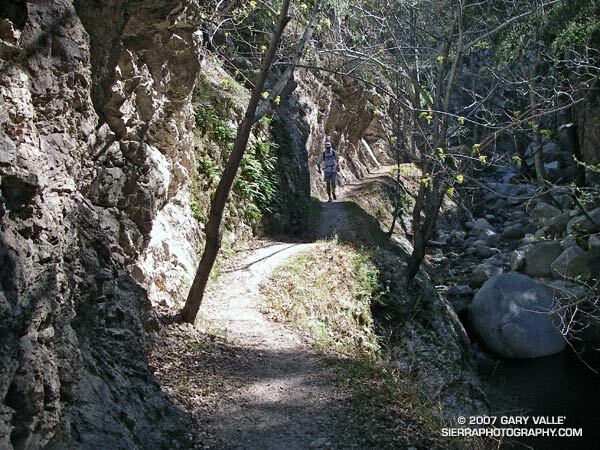 The Strawberry – Bear Canyon loop trail run is a longer, more adventurous variation of the run around Strawberry Peak described in the post Strawberry Peak Circuit. The photograph Fall Leaves On Bear Creek was taken on this loop in November 2005. As described in that post, instead of descending directly to Switzer’s from Red Box, this route descends the West Fork to Valley Forge Campground and then climbs up and over the shoulder of Mt. Wilson, and down into Bear Canyon, eventually working its way back to Switzer’s and Clear Creek. Without any wrong turns or other route finding issues the loop works out to about 25.5 miles with an elevation gain and loss of about 5500-6000 ft. The running (and hiking) is extremely varied, including fire roads, old road beds, easy trail, technical trail, and lots of up and down. Bear Creek’s lush canyon is gorgeous, but 20 miles into the run, it’s winding course and many creek crossings can prove demanding. I attempted to obtain a GPS trace of this route in 2005, but the steep, narrow canyons defeated my Foretrex 201. Not so with my Forerunner 205. I continue to be amazed at the 205’s performance. Here’s a Google Earth image and Google Earth KMZ file of the GPS trace of my route. Related posts: Spring Growth, Fall Leaves On Bear Creek, Forerunner 205. 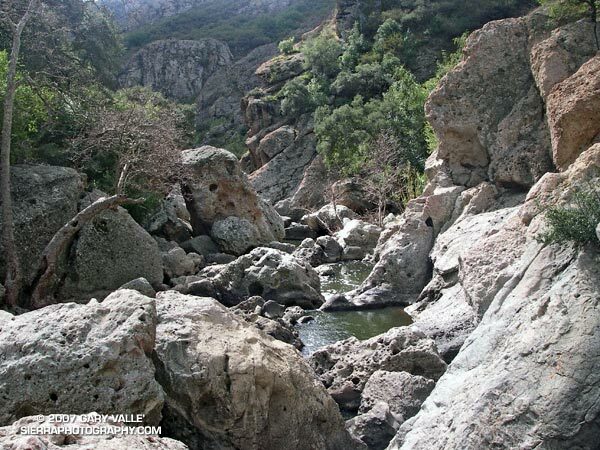 When the doors of the car slammed shut at Tunnel #1 on Kanan-Dume road we had no idea that about the time we expected to be back to the car, we would be scrambling among huge boulders in a dramatic gorge of volcanic rock sculpted by Malibu Creek. It wasn’t part of the plan. The plan had been to do a point to point run to Tapia Park along the Backbone Trail. But at the top of Upper Solstice Canyon, standing in a misty rain, we opted to run over to the Bulldog “T” and down into Malibu Creek State Park. And there we were, at least a few miles from the Backbone Trail, ogling the convoluted and pocketed walls along the creek, wishing we had our climbing gear! I paused for a moment on a narrow section of the Backbone Trail that zig-zags down a steep, eroded slope and then crosses a bridge over a narrow gorge before continuing down Rogers ridge. Below, a hiker stopped on the bridge to contemplate the canyon, and a mountain biker briefly walked his bike and then cranked up the switchbacks past me. It had rained the day before, and the cold front had resulted in a chilly, puffy cloud, postcard kind of day with breezy panoramic views of the San Gabriel Mountains, Downtown, Century City, Santa Monica, Palos Verdes, and the Pacific Ocean. The 7 mile segment of the Backbone Trail from Temescal Ridge fire road down to Will Rogers State Historic Park is one of my favorite (mostly) downhill stretches of trail in the Santa Monica Mountains. Over much of its length, the grade is not too steep, the footing consistent, and the running outstanding. My usual route for this run starts the same as for the Trippet Ranch Loop and Garapito Figure 8 runs, going up to the Hub from the end of Reseda Blvd. From the Hub it’s about 0.6 mile along Temescal Ridge Fire Road to the point where the Backbone Trail takes off to the left from the road. 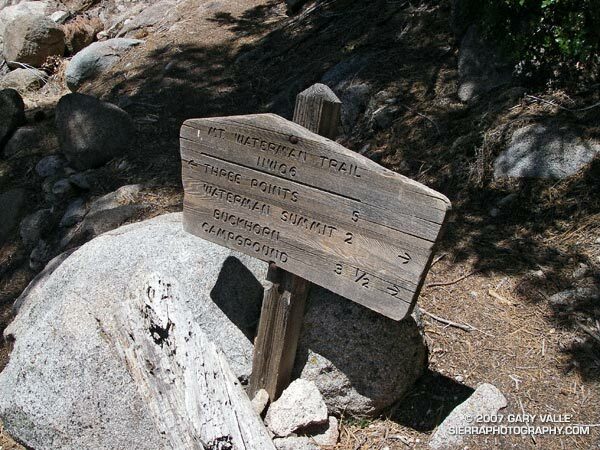 Overall the route is about 21 miles long, with about 3500′ in elevation gain/loss. Here’s a Google Earth image and Google Earth KMZ file of a GPS trace of the route. Updated Monday, July 5, 2010. The Google Earth image above shows two GPS traces. Here’s a larger image. The red trace was created using a Garmin Forerunner 201, and the yellow trace was created with a Forerunner 205. The course is comprised of a mix of fire roads and trails, through a variety of terrain and cover. The better tracking of the Forerunner 205 is clearly evident. Here is another view of the same course with the two traces. It is more compact and less obtrusive. Tracks are more accurate, and it almost never loses reception. It accepts routes for sequential navigation. Uploading and downloading data is easier and faster with the USB interface. The GPS chipset firmware (as well as unit firmware) can be updated. It has multiple customizable data screens that are easily displayed during a run. The performance of the GPS receiver in the Forerunner 205 continues to amaze me. It is tenacious. I was wearing the Forerunner 205 when I got caught in a fierce thunderstorm running in the Mt. Pinos area in July. Even in the middle of a thunderstorm, on a north facing slope, in a fir and pine forest, the unit did not lose reception. Here’s a Forerunner 205 trace of the run, exported from TOPO! Note that the traces going out and coming back very nearly overlay each other. The only exception is a real deviation between Sawmill Mountain and Mt. Pinos where I wandered off the trail to a minor summit. Also note that the trail is incorrectly marked on the topo map in the vicinity of Grouse Mountain. In early October 2006, I had a problem with not being able to power on my 205 after it was charged. Garmin promptly replaced the unit, under warranty, without charge. In June 2007 the replaced unit began to experience an intermittent issue where it would suddenly start to rapidly cycle through display screens, beep, and not respond to key presses. The only way to stop it was pressing the power + mode + reset keys. Garmin promptly replaced the unit, but charged a flat rate $79 repair fee. Oddly, when the unit was returned, the history included a few runs from the London, Ontario (Canada) area from late February and early March 2007. It’s been over three years since the flat rate repair/replacement of my Forerunner 205, and I’ve had zero problems. One apparent improvement is that the contacts on the back no longer get corroded from sweat. This used to cause problems with the USB connection and transferring data, and I would need to clean the contacts from time to time with a pencil eraser. In my opinion the Training Center Software is still poor, and for that reason I continue to use SportTracks. 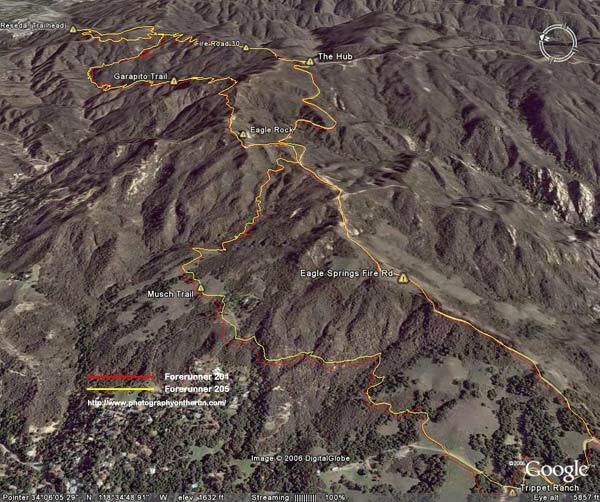 Note: The course is the run from the end of Reseda Blvd to Trippet Ranch described in the post Musch Trail Mule Deer.